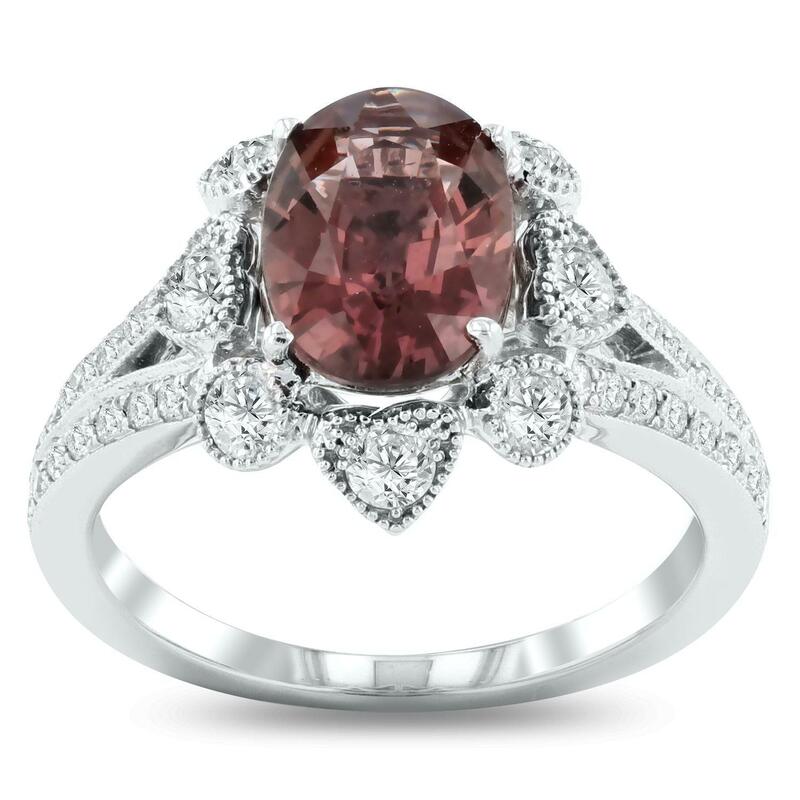 One electronically tested 18KT white gold ladies cast & assembled pink sapphire and diamond ring. The featured pink sapphire is set within a diamond floret supported by diamond set split shoulders, completed by a one millimeter wide band. Bright polish finish with milgrain detailing. Trademark is UCG. Identified with markings of "18K". Condition is new, good workmanship. One prong set oval mixed cut natural pink sapphire, measuring 9.89 x 6.98 x 4.28mm, exact weight 2.50ct., type II Clarity is eye clean, medium dark, moderately strong, brownish pink color, (GIA brPi 6/4), cut is good. Transmitting light with no distortion, transparent. No indications of heating. GIA Gemological Report attached. Graded loose prior to setting in the GIA Laboratory, Report # 1233779097. Eight prong set round brilliant cut diamonds, measuring 2.50 - 2.50 x 1.50mm (depth est.) approximate total weight of 8 Stones = 0.46ct. Graded in the setting. Thirty-Two prong set round brilliant cut diamonds, measuring 1.30 - 1.30 x 0.78mm (depth est.) approximate total weight of 32 Stones = 0.27ct. Graded in the setting. Total Weight of Colored Stones 2.50 ct.
Total Weight of Diamonds 0.73 ct.